The Sailing Events Association San Diego (SEA SD), www.sea-sandiego.org, is a non-profit organization that was formed in 2010 to organize and host world class sailing events in San Diego. The fact that the boats on a race course set in the bay are never very far away from the shoreline enable land based spectators around the edge of the bay, and especially those downtown, the ability to closely view competitive sailing events while enjoying the buzz and trappings that surround well organized waterside events. The term “Stadium Sailing” is sometimes used to describe our unique venue in the San Diego Bay and Harbor geographic configuration that we all enjoy year around. 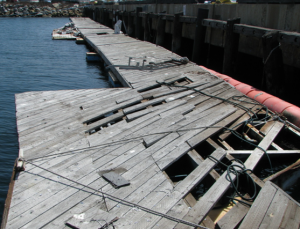 SEA Dock Alpha (150’x8’+30’x8’) was found at the National City Marine Terminal laying in ruin in August 2011. Alpha’s deck planking had become detached do to years of maintenance neglect and wave action working the deck fasteners loose plus there were several large holes in the deck where planks were missing. Additionally, the 30’x8’ attached sections at one end of Alpha would have to be removed allowing the remaining 150’x8’ section to be joined with the other two larger elements of the floating dock system that were being furnished by the U.S. Navy. The motivation of Sailing Events Association can be better understood by reviewing SEA’s clearly stated mission statement: “Our mission is to promote major sailboat racing events in San Diego for the benefit of the local economy”. In March 2011, SEA’s first event was to host to the Oracle RC44 Cup. 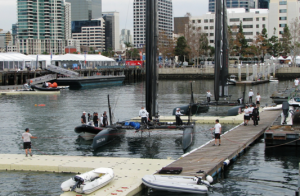 Based on the huge success of that inaugural event, SEA was able to convince the America’s Cup organizers that San Diego Bay was a proper venue and Sailing Events Association was a qualified host organization to deliver all of the details and terms specified in a very comprehensive contractual agreement. One of the many requirements and responsibilities of SEA was to build a floating dock system along both the Broadway Pier and the Navy Pier in downtown San Diego. As you can imagine, the reality of building a floating dock system to accommodate low profile AC45 high-tech wing-sailed racing catamarans and their ACRM’s fleet of support boats next to Port of San Diego piers designed to give proper berthing to 1,000 foot long passenger cruise liners and Navy ships requires temporary additional infrastructure to be designed, acquired and installed. To make the transition from the pier that is approximately 10 feet above the water line down to just 18 inches above the water required by the specifications agreed to was going to dictate that several different types of floating craft would be needed to create this stair-step down access. The U.S. Navy was called upon to help provide some of the larger pieces to this floating dock puzzle. Steel floating YC barges were used as the first step, down a ramp from the fixed pier height to about 6 feet above the water. Next was another ramp down to a steel floating causeway barge section that was about 3 feet above the water. The last piece of this floating dock puzzle was to use two wooden, “marina style”, floating dock elements about 18 inches above the water on each side of the Broadway-Navy Basin to accommodate the race boats. One of the biggest challenges was that there were no floating marina style docks anywhere in the San Diego area that were available. SEA Dock Crew Volunteers rebuild Bravo (100’x8’) that was found stored at the Grape St. 1 Pier, in worse condition than Dock Alpha, because there were missing float elements under the dock that allowed the dock’s structure and deck surface to lie below the water’s surface accelerating the rot and deterioration of the wooden components making up the dock. Acting on “tips” from Port Tenants, several different condemned floating docks were located in San Diego Bay that were deemed usable, if rebuilt, reconditioned and “recycled” from trash. 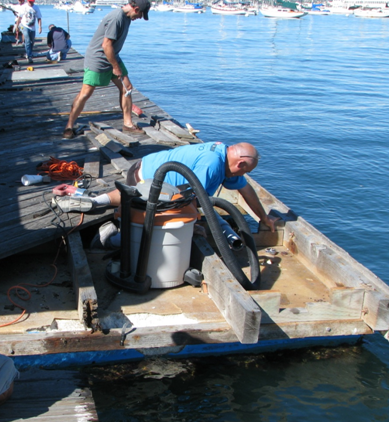 In both cases, working with donated materials, volunteers from the Maritime Museum and volunteers that answered the SEA-SanDiego.org web site came forward with their own personal tools in hand to assist with all of the hard work that was required over the six week period needed to overhaul and refurbish both of these dock systems by the November 1st deadline. Once in place, these last 2 important pieces to the floating dock system built in the Broadway-Navy Basin to properly host the America’s Cup World Series San Diego Regatta event would be complete. Volunteers, all of them sailors, stepped forward to make this project happen. Several SD Port Tenants donated their professional expertise and raw materials at no cost. What little money that was spent went for fasteners and hardware needed to complete project. Dedication, skill, hard work and a huge time commitment turned WASTE into a RESOURCE. For more information contact SEA-San Diego. SEA San Diego is a non-profit whose mission is to bring high-profile, exciting sailing events to San Diego for the benefit of our community. Copyright © Stadium Sailing in San Diego Bay. All Rights Reserved.